In a past Pond Boss article, Bob emphasized that math is important when it comes to pond management. Calculating water volume, monitoring lengths and weights of fish, maintaining water quality, and other crucial areas is about…math. We must have an accurate measurement of surface area. Knowing the size aids when it’s time to select stocking rates for fish, apply herbicides, fertilize, and harvest fish. 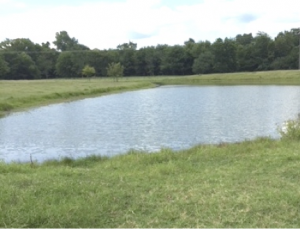 Want to drill a water well, specifically to supplement pond water? You must know important math. A surface acre covers 43,560-square feet; comparable to a football field. Remember that important number. Bob received a call from an excited pond owner who had rehabbed a lake north of Dallas. He was ready to stock. When asked lake size, the gentleman said earthmovers told him almost 30-acres. Bob traveled the area regularly and didn’t recall seeing such a project. He suggested measuring it to be sure. After all, the owner was about to spend approximately $400 per acre stocking. If 30-acres, the cost would be $12,000. It took about two hours to complete measurements. Final math–slightly more than 18-acres. A big difference, not to mention stocking savings. When calculating water volume, you must know surface area as well as average depth. Here’s another significant point. One acre, one inch deep, is 27,000-gallons. If you’re planning to drill a well, use this equation to your advantage. While presenting a seminar at a Purina store, Bob met a gentleman who was drilling a well to supplement his pond. Bob asked the pond size and projected well flow. The pond was almost 5-acres. The contractor promised flow would gush at least 12-gallons per minute. After a little math, Bob determined 5-acres times 27,000-gallons equals 135-gallons per inch of pond. If a well produces 12-gallons per minute, divide 135,000 by 12. It takes 11,250-minutes to pump that much water. Divide that by 60-minutes per hour and you get 187.5-hours. Divide that by 24-hours per day. We learn it would take a 12-gallon per minute pump almost 8-days to add one-inch of water to the pond. The answer wasn’t what the gentleman wanted to hear. On a hot, dry summer day, his pond can evaporate up to one-half inch daily. The well would not keep-up with evaporation. Knowing water volume is necessary for calculating some herbicides. If a one-acre pond averages 5-feet deep, here’s how we figure volume. Consider 43,560-square feet is an acre. Multiplied by 5-feet equals 5-acre-feet of water. Since 27,000-gallons is an acre inch, we multiply by 12 to calculate an acre-foot. That number is 324,000-gallons per acre. We then multiply that big number by 5-acre-feet to estimate the volume to be 1.62-million gallons of water. If you’re tracking fish growth, one of the best tools is comparing lengths to weights. There are tables of standards for each fish species. Compare fish data to industry standards and you quickly know how well they are growing compared to accepted norms. This entry was posted on Thursday, March 28th, 2019 at 4:30 pm	and is filed under News & Updates. You can follow any responses to this entry through the RSS 2.0 feed. Responses are currently closed, but you can trackback from your own site.